NSW Metro Under 19 wicketkeeper-batsman Baxter Holt claimed six catches on the weekend for Eastern Suburbs in McDonald's NSW Premier Cricket. Photo CA/Brody Grogan. 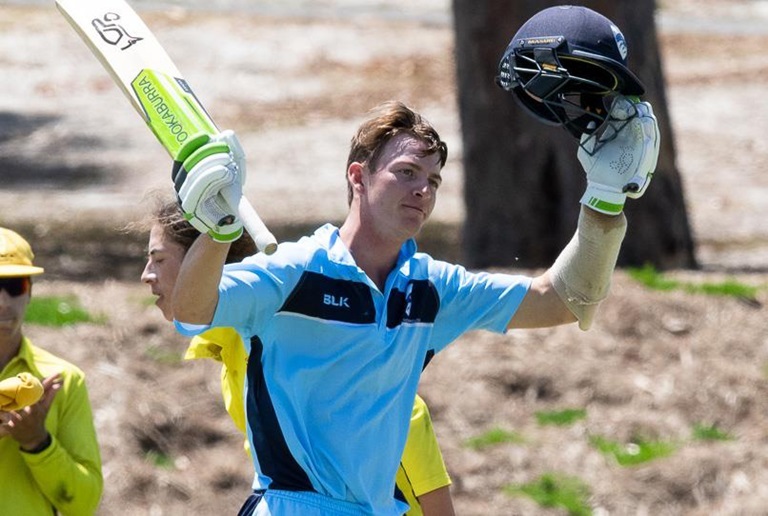 New South Wales Under 19 representatives, Rupert Lilburne, Glenn Winsor and Baxter Holt, have made important contributions to their clubs’ wins during round ten of McDonald’s NSW Premier Cricket over the weekend. Pace bowlers Lilburne and Winsor, who were both integral members of the victorious ACT/NSW Country side at the Under 19 National Championships in December, both claimed their maiden five-wicket hauls in the top grade. While Holt claimed six catches in an innings for Easts to equal the record for the most catches in an innings as a fielder in First Grade. The Australian Under 19 wicketkeeper-batsman and Blues rookie joined current Gordon captain Harry Evans (2013/14), Anthony Clark (2002/03), Kevin Geyer (2000/01), Keith Wyatt (1971/72), the late former Australian Test batsman Billy Watson (1954/55) and Ernie Fletcher (1942/43) as the other six players to achieve the feat. Winsor returned the stunning figures of 5-9 from three overs for Gordon in a comprehensive outright victory against Hawkesbury. Lilburne collected 5-40 for Eastern Suburbs in a first innings win over Blacktown. The highest score of the weekend was made by Mosman middle-order batsman, Jake Fawcett, who scored 167 from 174 balls in a convincing first innings victory against UNSW. Bankstown left-arm orthodox spinner Ben Taylor claimed best figures with 6-73 in a five-wicket first innings win over reigning premiers Parramatta. It was the incredible spell of Winsor that raced through the Hawkesbury lower order in the first innings which gave Gordon the impetus for the outright victory at Chatswood Oval. Gordon bowled out the Hawks for 127 and 205 across Saturday and Sunday. The hosts made 9/194 declared and 3/141 to seal the outright win. Tym Crawford also claimed 4-45 for the home side in the second innings. Hawkesbury batsman Dale McKay also went past 5,000 runs during the match. His second innings 55 moved him to 5,026 First Grade runs at an average of 31.41. Lilburne was equally important for the Dolphins win at Joe McAleer Reserve. He claimed five of the top seven first innings’ wickets to fall for Blacktown, who were bowled out for 235, within 57 overs. In reply, Easts made 5/238 declared. Blacktown were asked to bat again by the visitors and finished the second day at 5/134. Holt claimed four of his six catches in the slips during the first innings with NSW Blues captain Peter Nevill taking the gloves for the Dolphins. Three of those came from the bowling of Lilburne. He finished with seven for the match. Blues quick Harry Conway also collected five wickets for the match with 2-53 in the first innings and 3-38 in the second. At Village Green, Fawcett (167) scored almost half the runs for Mosman in the first innings total of 338 against UNSW. It was his third First-Grade hundred. Fawcett added 214 for the sixth wicket with keeper-batsman Ashley Doolan (85). In reply, UNSW was dismissed for 186 and forced to follow on. However, courtesy of English opening batsman, Harry Brook (81 not out), the Bumblebees avoided outright defeat to finish the match at 2/133. Brook also top-scored for the Bees in the first innings with 62. UNSW opening bowler Declan White claimed 4-55 from 17 overs in that innings. Taylor returned the outstanding figures of 6-73 from 33.2 overs including 13 maidens at Old Kings Oval. It took him to 37 wickets for the season at 16.92. His six-wicket haul helped Bankstown dismiss Parramatta for 286 early on day two. Blues batsman and, captain of the defending premiers, Nick Bertus (61) top-scored for the hosts. An unbeaten 155-run sixth wicket partnership between Chris Ridley (112 not out) and Mitch Brown (74 not out) secured victory. It was the fourth first-grade century for Ridley. Last round he went past 3,000 first-grade runs. Blues fast bowler Liam Hatcher claimed his 100th First Grade scalp for Fairfield-Liverpool in a first innings rout of the Sutherland batting order. The men from the Shire were bowled out for 69 in 27.1 overs. Hatcher (2-22) claimed two of the ten wickets with Blues rookie firebrand, Chad Sammut (4-27) and Harmon Sandhu (4-18) claiming the remaining eight. In response, Fairfield-Liverpool was also bowled out for 130 on the first day. Fast bowler Jayden Brown returned the outstanding figures of 4-7 from seven overs and NSW Metro Under 19 gloveman, Aiden Bariol, completed four catches and one stumping behind the stumps. Sutherland resumed on Sunday at 1/29 and progressed to 3/270 before a declaration was made with a lead of 209. Blues leg-spinning allrounder, Daniel Fallins (56) was promoted up the order for the second innings and shared a 113-run second wicket partnership with Jarryd Biviano (77). Jamie Brown (64 not out) and Tom Doyle (60 not out) both remained unbeaten when the declaration was made. Hatcher also picked up 2-84 in the second innings. Fairfield-Liverpool finished the match 4/125 and the game was drawn. The ball again had the better of the bat at Howell Oval. Penrith was only required to bat once in a historic defeat of Northern District. The Panthers bowled out the visitors for 60 and 88 to win by an innings and five runs. It was the first time since 2013, when Randwick Petersham was bundled out for 45 and 71, that a team had been dismissed for less than 100 in both innings of a First Grade match. Penrith left-arm orthodox spinner Luke Hodges produced the excellent figures of 5-11 from 10 overs in the first innings, while opening bowler Ryan Fletcher claimed 5-36 in the second. Fletcher finished with match figures of 7-44. Blues top-order batsman, Ryan Gibson, also picked up a handy 3-14 in the second innings, with his medium pace. The hosts made 153 during its only innings with the bat. Northern District off-spinner Tom Felton became the third player in the match to return five wickets in an innings. He claimed 5-22. The outright win sent Penrith to second on the ladder four points adrift of Sydney University. The wickets also tumbled at Pratten Park. Campbelltown-Camden was dismissed by Western Suburbs for 123 after the Ghosts won the toss and elected to bat. Quincy Titterton (5-27) took his first five-wicket haul in First Grade for the Magpies. He claimed 8-61 for the match. Wests finished day one 7/116 and were bowled out for 166. Seventeen-year-old Campbelltown-Camden leg-spinner, Tanveer Sangha, claimed the first four of his eight wickets for the match in the first innings. He collected 4-56 and 4-71 in each innings but could not prevent an outright win for the hosts by five wickets. The Ghosts were bowled out for 176 in the second innings and Wests required just 134 to seal the 12 points for outright. The Magpies reached the target five wickets down. Sydney University stayed at the top of the table thanks to a three-wicket first innings win away to Randwick Petersham. The home side was bowled out for 274 and the students reached victory in 63 overs. Hayden Kerr made his maiden First Grade century on Sunday in blistering fashion. He peeled off 133 from 137 balls including nine fours and as many sixes. Kerr shared a 123-run fourth-wicket partnership with Varun George (48). Leg-spinner Devlin Malone (5-86) recorded his fourth five-wicket haul of the season on Saturday to help set up the win. It took him to 45 wickets for the campaign at an average of 16. ACT/NSW Country bowler Joe Kershaw also claimed 4-48. Adam Semple (4-78) picked up four wickets for Randwick Petersham. UTS North Sydney moved to fourth on the ladder with its fifth successive win in the competition at North Sydney Oval. The Bears defeated local rivals Manly-Warringah by five wickets on the first innings. North Sydney captain Thomas Jagot (91 not out) and Ben Bryant (70) put together 159 runs for the fourth wicket in the successful chase. Norths made 5/226 in reply to 225 posted by Manly-Warringah on the first day. Left-arm seamer Matt Alexander (4-24) returned best figures for the victors. Blues rookie paceman Ryan Hadley also claimed the tidy figures of 3-34 from 19 overs in the loss for Manly. Canberra batsman, Blake Macdonald (141 not out), made his second century of the season in just his fourth innings of the 2018/19 Belvidere Cup in an upset victory for the Saints over Sydney. Sydney trailed ladder leaders by a solitary point heading in to round 10. However, the Tigers were dismissed for 258 and St George chased that down with eight wickets in hand to wrap up first innings points. MacDonald shared a 156-run partnership with opening batter, Matthew Hopkins (73), who went past 3,000 First Grade runs. He has now amassed 3,060 runs at 32.21. Twenty-year-old Macdonald has 331 runs to his name for the Saints this season at 110.3. Saints leg-spinning allrounder Tom Engelbrecht claimed 4-66 against Sydney. Western Suburbs 166 (C Blaxall-Hill 42no C Hotham 30no I Taylor 27 T Sangha 4-56 L Webb 3-50) and 5-134 (A Isherwood 55no J Psarakis 29 I Taylor 24 T Sangha 4-71) bt Campbelltown-Camden 123 (O Robinson 38 P Wells 31 J Cormack 23 Q Titterton 5-27 M Tudehope 3-43 L Sparke 2-18) and 176 (J Browne 44 O Robinson 34 A Yabsley 24 L Webb 21 L Sparke 3-25 Q Titterton 3-34 C Blaxall-Hill 2-36) outright at Pratten Park. Sydney University 45 Penrith 41 Sydney 38 UTS North Sydney 37 UNSW 35 Parramatta 31 Bankstown 31 Randwick Petersham 30 Gordon 30 Sutherland 28 Western Suburbs 28 St George 26 Campbelltown-Camden 26 Northern District 26 Eastern Suburbs 26 Mosman 25 Fairfield-Liverpool 22 Blacktown 21 Hawkesbury 20 Manly-Warringah 19. Sydney University 1087 Penrith 918 Parramatta 851 Northern District 781 Bankstown 780 Manly-Warringah 770 Sydney 769 Gordon 754 Eastern Suburbs 741 Randwick Petersham 711 Mosman 704 Sutherland 647 St George 647 Blacktown 599 UNSW 597 Campbelltown-Camden 573 UTS North Sydney 547 Fairfield-Liverpool 529 Western Suburbs 448 Hawkesbury 439.